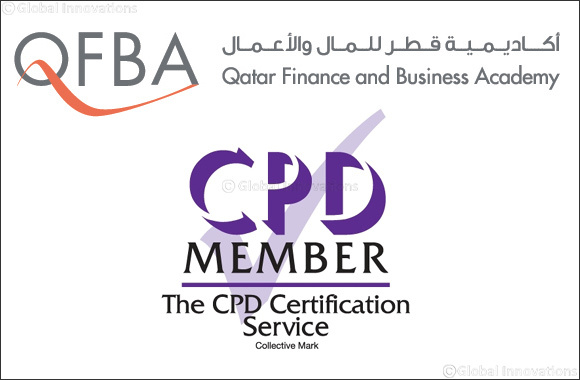 DOHA, Qatar –06 November 2018 - Qatar Finance and Business Academy (QFBA) has announced that it has recently received the most acclaimed membership of The CPD Certification Service. The accreditation is to acknowledge that QFBA courses comply with universally accepted principles of Continual Professional Development (CPD) and have been structured to meet the criteria of personal development plans. The CPD certification means that the content and structure of the courses have been independently assessed and approved for multi-disciplinary and industry-wide continuing personal and professional development purposes. Continuing Professional Development (CPD) is the holistic commitment of professionals towards the enhancement of personal skills and proficiency throughout their careers. The foundation of CPD is based on the auspices of vocational and skills-based or ‘practical’ learning. The CPD certified training is a testament that the learning activity has reached the required CPD standards and benchmarks, and that the learning value has been scrutinized to ensure integrity and quality. Furthermore, the CPD Certification Service provide recognized independent CPD assessment compatible with global CPD standards. A structured, practical and methodical approach to learning helps employers across industries to keep key staff and develop the skills & knowledge in their organizations to maintain a sustainable and competitive advantage. The CPD Certification Service provides recognized independent CPD accreditation compatible with global CPD requirements. Continuing Professional Development is essential in helping individuals, organizations or entire industries to keep skills and knowledge up to date. Providing CPD enables organizations to become a knowledge bank to key stakeholders of your organization. CPD accredited training courses, workshops and events allow professionals to use the learning time towards individual CPD requirements. Such strong membership is slated to enhance the scope of QFBA in its future endeavors and will ultimately benefit students who are a part of QFBA.